Alcohol Addiction • Alcohol Addiction Treatment Florida • Alcohol Treatment • Alcohol treatment floridaWhy Do People Become Addicted to Alcohol? Why Do People Become Addicted to Alcohol as Teenagers? Have you noticed that some people are social drinkers, never get drunk, and don’t become alcoholics? Other people can’t control their drinking, and it ruins their physical and mental health. Why do people become addicted to alcohol? The answer to the question is complex and involves a combination of genetic, physiological, psychological and social factors. Learn more about what causes people to become addicted to alcohol. Click here. For generations the question has been asked, “Why do people become addicted to alcohol?” Genetics can play an integral part in the development of alcoholism. Research reports estimate the children of alcoholics are four times more likely to develop the disease than those of non-alcoholic parents. Environmental factors also play a part as children of alcoholics are exposed to excessive drinking and its associated behaviors. Another contributing factor resulting in alcoholism is the way alcohol alters the brain’s chemical balance. Psychological issues, depression, and other mental health issues increase a person’s risk for developing alcoholism. Teenagers and young adults often fall victim to peer pressure in addition to all the other factors. Youth are often goaded into playing drinking games and for some the result is tragic. Advertising makes drinking look glamorous and exciting. You never see people passed out or fighting in beer commercials. There has been an increase in deaths from overdose (alcohol poisoning) in recent years, and the number continues to rise. Medical scientists are always searching for what makes alcohol addictive as it seems to have more than one cause. 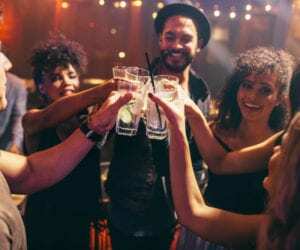 Research suggests the effects of alcohol on the brain with its temporary mood boosting and euphoric feelings encourages people to continue drinking in order to achieve the same effect over-and-over, but there is a difference in the response between light and heavy drinkers. After drinking equal amounts of alcohol heavy drinkers release more endorphins and feel more intoxicated than light drinkers. There are some people who are able to have the occasional casual drink without it disrupting their mood, attitude, or mental outlook. That causes many to ask, “Is alcohol addictive?” The answer is complicated. Some of the causes of alcohol addiction are environmental, genetic, emotional, and physical. The cause is not the same for every person who develops alcoholism. Finding the cause of an individual’s alcoholism is part of the treatment program WhiteSands Addiction Treatment Centers provide. The staff excels in the treatment of dual diagnosis, which is common in patients dealing with alcohol addiction. If you have a loved one suffering from alcoholism call WhiteSands at (877) 855-3470, and speak to an addiction specialist. Alcoholism destroys lives financially, physically, and mentally. Every day an alcoholic is drinking instead of receiving help, he or she places their life in jeopardy. Violence, car accidents, and overdose are common causes of death for young alcoholics. Get help today from WhiteSands Treatment Centers in Tampa and Fort Myers FL. Call (877) 855-3470 today. ← How Long Does Rehab Last?